Professor, it's Soule; we have a situation on Hyperion, and we may need your assistance and expertise. It involves the Tkon; I know you've had experience with them lately. Do you know of any kind of Tkon contaminant? We have no idea what we're dealing with, or what it's capable of... it's already taken over one starship, and it may be metamorphosing into something else. I need you to call me back as soon as possible, Hamlet. I wouldn't make this a priority message, unless I really meant it. lovely ship-to-ship interactions, even if the same player! If there is something to learn from other ships I suggest we attempt to use it. Well done Andrew! Soule hobbled back to the sofa from the replicator, with two large mugs of Douglas' secret hot chocolate, with a smile on his face. "I'll have to tell you the secret one of these days." He chuckled. Isabelle was relaxed in the sofa cushions feeling comfortably drowsy now that they had arrived back home. "Mmm.. Thank you." She gratefully accepted her mug of hot chocolate and breathed in deeply, the delicious aroma wafting into her nostrils. She grinned. "If you told me, it wouldn't be a secret.." she teased him. "Although.." she took a sip. The cinnamon was obvious.. there were cinnamon sticks used as straws. Then there was the white chocolate drizzled on top, and the marshmallows, and the chocolate powder drifted over it all. "Cardamom? Dash of jalapeno?" she guessed. There was hint of something.. a taste that seemed familiar, but exotic all at the same time. "I can't quite place it.." she grinned. He blinked a number of times, silently cursing her much more refined French palette, she might be on to him. "Of course, we have to be married before I tell you; otherwise this could all be an elaborate ruse to get my family's recipe." He sat down beside her, sipping his chocolate, chuckling to himself. "It all makes sense now... you're a spy for some trader after my recipe, but I'm so dashing that you've accidentally fallen in love with me." He grinned at her. "Oh no.." she replied dramatically in mock dismay, "You've got me.. whatever shall I do?" She giggled at him, savouring another sip; the taste of cardamom was obvious now. "I'll just have to break that contract with those Ferengi and go into hiding...we'll never be married now.." She leaned over and kissed him, tasting the chocolate on his lips. "But at least the family secret will be safe." She grinned back at him, winking. "Well I can't let that happen. Can I? I'll just have to *negotiate* with these Ferengi; I'm sure they can be brought to understand." He grinned. "I can't go galavanting around the galaxy without the person who makes the stars shine; the splendour of the universe is a little hollow without someone to share it with." He kissed her, and nuzzled her nose. "Indeed it is.. " She put her mug down on the coffee table and wrapped her arms around him. She fell silent, just looking into his face and stroking along his jawline. The incident with the ancient Tkon's enemy was still in the back of her mind; the crew of the Hyperion could have been killed just as easily as the crews of the Herald and the cardassian ships. It made her appreciate their time together even more. "Imzadi, you are worth more than the stars themselves to me..The universe would be a very lonely place without you." His nearness was making her breathless. Her lips met his again, awakening fire in her body. Soule ran his fingers through her hair, holding her in a passionate embrace. He thought to say something, but couldn't bear to part from her lips as they slowly slipped backwards onto the sofa. He looked up at her, catching his breath, and laughed before falling silent himself. He could see something in her eyes, and it made him stop and think about the last few days. He closed his eyes and held her close. "I love you too. " she breathed. More words didn't seem to matter right now.. swirling around them was the mixture of relief that they had somehow survived an incident of potential galactic proportions, mixed with the grief and urgency of the disappearance of someone close to them. She too closed her eyes, and breathed in his scent, basking in his embrace. He tickled the back of her neck, to comfort himself as much as it was to comfort her, and sighed; breaking the silence. He wriggled into a comfortable position, and placed his hand on her side, before kissing her very gently on the cheek. He stared at her for a moment, just taking in the features of her face. She lifted her head and gazed into his eyes, remembering something he'd said the night he proposed. That no matter how difficult or chaotic things became, there were perfect moments to be found in life. And this was one of them. "So.. how about the rest of dessert..?" She slid her eyes towards the bedroom and back towards him again. He followed her eyes, then looked back to her. "Lead the way." He smiled. After being simultaneously shooed from and dragged off the bridge by Dannan and Izzy respectively; Soule was now very happily humming to the whirr of the turbolift, with his head resting on Izzy's shoulder. "Maybe you're right. I was overthinking things... nothing's exploded yet, and this is usually how far I get." He chuckled. "So, what would you like to do on the station, Imzadi?" He asked, lovingly pecking her on the cheek. "Non-explosions are always good.. less medical reports to write." Isabelle grinned at Soule and thought about what was on offer at the starbase. From what she could remember, there was a viewing deck, holosuites, arboretum, replimat, restaurants, souvenir shops, probably a bar or club to round things out. The usual station fare. "Anywhere I don't have to wear a dress uniform for a few hours is fine by me. I've been dodging the Admiral and her entourage for a few too many days now.." She chuckled back, relaxing against Soule and leaning her head against his as the floors flickered past. "I wouldn't mind just taking a walk in the arboretum or finding a nice quiet corner somewhere." She put a finger to her lips as a thought struck her. "Although.. hm.. I wonder if that chinese restaurant is still there? The shrimp szechuan with vulcan spices was legendary." "You've been dodging the Admiral?" He winced. "I had an informal meeting with her the other day; I had to take a few minutes before going in, to contemplate finding religion and wearing it's most powerful protective idol." He gave a goofy chuckle and wrapped his arms around Izzy's waist, before closing his eyes and sighing thoughtfully. "A walk through the arboretum sounds nice though, might be some exotic samples from the nearby systems, something with vivid colour's that Human eyes have never seen before..." Smiling at the idea, he continued. "As for dinner; I've never had shrimp before, but if it's legendary, how am to argue with that kind of write up?" "Shrimp's a little like gagh, only less.. crawly." She giggled, settling against him. "Sounds like a plan then.. Maybe we could even bring back one of those exotic plants for the wedding." "As for the admiral, I suppose I haven't been dodging her anymore than anyone else on the ship has. Being summoned by her is a different story though... I'd probably have found religion myself if I thought that would have helped." She grinned, although she was curious about what the admiral could have wanted. "Did the meeting go all right? You seem to have been lost in thought a little more than usual lately.."
"Great minds..." He winked. "And I shall have to defer to your more sophisticated palate... I do like gagh, but I must say that wrestling your meal gest tedious; so we'll see." His smile fell somewhat as he thought about the conversation, displaying what Izzy had not two seconds mentioned. "I'm not entirely sure; it was strange. She basically told me to be better at my job, but..." He stared off again, going quiet. Isabelle had a feeling that whatever the admiral had talked to him about, it couldn't have been too horrible, or she'd have probably heard about it already. Or he'd have been more moody, and not just contemplative. She gazed at him for a moment, giving him some space to gather his thoughts, and leaned her head on his shoulder. "Something that you have to make a decision on?" she guessed. Maybe it had something to do with a mission.. or a job offer, like the one from the Daystrom Institute not too long ago. "I'm not sure. She expressed a keen interest in the future of my career, and there was more than just the words she said." He gave that deeply pensive look again. "She started out sounding like she was gonna offer me a job, then started saying how I could be a brilliant captain one day; but upon my insistence that someone would have me killed before then... she didn't bat an eyelid; she seemed to agree, in fact." He looked down at her, remembering the part about family and trust, smiling that she was the one he trusted the most. "Then the conversation steered to politics..."
"That is strange.. not to mention chilling, and vaguely threatening.." She turned herself towards him and wrapped her arms around him, holding him close. "Her assessment of you for Captain one day is good.. but the rest.. yes, I can see why you haven't said much about it. I'd be mulling it over alot too." "Nah...." He fidgeted slightly, squeezing her tighter for comfort. 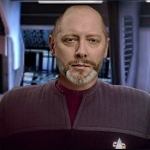 Thinking back to the conversation; his mention of Section 31, and the subsequent challenge to the validity of the uniform, to just the Admirals reaction, left him paused for thought. "I..." He wasn't entirely sure he really deserved to ever be a captain. Sure there were plenty who go beyond the rank of captain who dont deserve it, simply by the plots they thread, and the heinous things they enact. But his idealisation of a Starfleet Captain, is a paragon; someone who stands above yet does not lose their head, shining like a beacon in a storm. He gulped, the gears grinding in his head probably obvious to Izzy, yet he still thought he'd try and hide it. "I'm way too... punchy and shouty for that I think. Gone are the days of Admiral Kirk." He chuckled. "But, I do think she has a plan for me, somewhere down the line. Which, is not something I'm entirely unfamiliar with, but it is unsettling nonetheless. And I can't help but feel that all the clues were there, to answer something I dont have a question to yet." He knew how obsessive and paranoid that sounded, but he was sure she was use to it by now. "Tell me I'm and idiot, and I'm just over thinking things, again." "I'm not sure I'd want to be captain either.. But I think the ones that don't want to be one in the first place make better captains. There's a certain humbleness that they bring to the job. You've got that, and honour, which are two very good qualities. I think you could do it someday, if you decided you wanted to." She smiled, but became a little bit pensive herself, thinking of the ramifications of what Soule had said. "The admiral is certainly being very mysterious.. I won't say that you're not overthinking things, but I think your worry is valid if she makes you feel unsettled. But maybe it's not all bad. Maybe it's more positive than we think it is?" She hugged him again trying to cheer him up, although she still felt a little unsettled herself.. The meeting did seem strange...why would the admiral go out of her way to do this? Maybe Soule was right, that she had some grand plan in mind, which she hoped would turn out all right in the end. The turbolift chime dinged, and she looked up as the door slid open to the corridor where the docking hatch to the station was located. "So.. let's see what there is on this station.. Shall we?" "Well..." He swayed with her in his arms, hoping to comfort her as much she did him. "I'll keep my good eye open, and we'll see what Admiral Vera Hill has in store for us.... I hope it's cake." He chuckled, nudging her on the shoulder, and smiling lovingly at her. He was trying to push the thoughts out of his head, for both his and Izzy's sake, but he couldn't help but wonder if the Admiral had spoken to anyone else, and if not; why him? Looking down the corridor as the door opened, he became more determined to enjoy himself, and not spoil the short time they have off the ship for Izzy. He pecked her on the cheek, and held his arm out. "Let's go es'ploring." She gave him a smile, her eyes glinting, and stood on her toes to steal a kiss on his lips before taking his arm. The station awaited them through the docking port, and the pair made their way through several of their crewmates milling around the entrance to the Hyperion, as they tried to figure out which direction to take. Isabelle spotted a console conveniently located on the boarding deck. "Hm.. there's not as much here as I thought there would be.. I suppose my information was out of date. Or, I was remembering the wrong station.. they all look alike after a while." She peered at the console for a few seconds, looking through the list of offerings. "Hm.. there are two restaurants, one of which appears to be Romulan... and a bar. But.. where's that arboretum?" Isabelle swiped through a few maps trying to find it, with not much luck. "Wait a minute, that might be it.. No, it's just a science lab. Hm.. " she swiped through a few more levels of menu. "Maybe it's this one? Wow, they really buried it.." She pointed to a small room with a plant symbol on it, on one of the lower levels. "Oooh, I dont mind Romulan food, they use interesting spices." Station bars are generally fairly seedy places, even Federation and Starfleet one's, and Soule thought it best to veer away from it immediately, as he followed her finger swiping through the station diagram. "Ummm... yes, no... wait, yeah... that one I think." He replied in agreement. "That's really out of the way isn't it... ah well... still things to see." He grinned, taking her hand, almost skipping off down the corridor with her. "Y'know, I have no idea why I like flowers so much. I apparently just did one day. It confused Arthur in our academy dorm, when he woke up and suddenly there was a bromeliad and a catcus sitting on the windowsill." He laughed. "He didn't like change... or cacti." She laughed with him, cheerfully swinging his hand as they went, and grinned as she tried to imagine how Soule could suddenly develop an affinity for cacti and other flora. "So.. Arthur and the cacti didn't get along, I take it?" They turned down several corridors and kept following the sign for the arboretum, which mysteriously seemed to point in opposite directions at different points along the way. "Nooooope. I often caught him arguing with it; saying it used to maliciously alter his calculations, by making the numbers taste turquoise when they were went to taste like cobalt." He looked around the junction they had come to, staring between signs with a confused look on his face. "To this day, I still dont know what that meant...." He paused as he darted his head back and forth. "Well the bledy hell is it?" He chirped with mild frustration. "Is it that way?" He looked to Izzy for a second opinion, pointing down one of the corrdors they had checked already, hoping it might of had a sneaky turn off that they missed. She couldn't help but laugh at Soule's description of his former roommate's reaction to his cactus. "Wow.. that's unusual behavior, even for a genius." She grinned. "So he was a synesthete, among other things.."
On the wall at the end of the corridor, a tiny sign with a plant symbol which went previously unnoticed by the pair, seemed to point downwards. But there was no turbolift or set of stairs. "Uhh.. huh? I don't know... " She looked around for a little while longer. "Computer.." She cocked her head in curiosity. "Which way is the arboretum from here?" "The arboretum is two levels down." "Um..." She looked around, seeing nothing but a maintenance hatch. "What if..?" She pressed the hatch button, and it revealed a vertical ladder that stretched downwards into the bowels of the starbase. "Apparently, it's that way.." she chuckled, in response to his question. Before they continued on, Isabelle turned to him with a pensive look of her own on her face, taking advantage of the pause in their exploration. "Soule, do you remember the nebula we passed through, when everyone was having visions? I... had a vision of my own that you should know about.." She hadn't yet said much about it, because, like his meeting with the admiral, it was something that she'd had to process first. "Yeah. Between him and Professor Hamlet, life at the academy was pretty interesting." He briefly remembered a few times those two had met, and how woefully underqualified he was to understand what they were talking about. "There was never a dull moment." He chuckled, looking at the hatch opening. "Speaking of which..." He replied to the confusing layout this station had, and how many strange turns it has taken. "You'd almost think they didn't want us to find it." "Yeah I remember..." He quickly turned to her, worried about what she could have seen. He had pondered his own experience in the nebula, and while it wasn't exactly terrifying, it had left him with burning unanswered questions. "Are you ok? It wasn't something horrific was it? You never mentioned any before..." He gulped, looking sad and worried that it could be something about him. "I'm fine.." She gave him a reassuring smile, wrapping her arms around him. "It wasn't anything bad. More.. intriguing. Hopeful, even." She gulped, suddenly nervous, although she knew there was no reason to be. " Um.. So, do you remember that conversation that we had a few weeks ago, about having a family one day? Well, since then I've been thinking about it quite a bit. And when we were in the nebula, I saw her.. or him. A child, right there in front of me in the corridor, about six or seven years old. I wasn't sure if it was a boy or a girl.. but it looked like me.. and you, at the same time." He didn't really know how to respond to what she'd told him; his jaw flapped in the air, but words didn't escape. He looked shocked and confused, but the silence that fell, quickly became deafening, and he knew he had to say something. "W... wh... what...what..." He stuttered before clearing his throat. "What was she like? A... a..... and what have you thought about?" He gulped again. "She was..." She thought she'd go with 'she' even though it was hard to tell; the image had seemed to shift between the two. "She was playful, and curious.. reddish blonde hair, blue eyes. She wasn't there for more than a few seconds before I dropped my light from surprise when I saw her.. and when I picked it up again, she was gone." She gave a small smile at the memory, even though she suddenly felt awkward about what she was going to say next. "I.. um, it's just that I've been thinking about... wondering.. if you wanted.. to try to start a family?" She managed to stammer it out with a flush of her cheeks, but she knew she had to get this off of her chest at some point.. "I mean.. after we get settled in after the wedding.. maybe in.. um, about a year or two?" He was speechless; his heart a flutter, his jaw trembling, and his stomach wrapped tightly in knots. He closed his eyes, his mind wandering off to the possibilities; a tiny hand in his, those big eyes with that familiar shade of blue looking back up at him. "Well... I thought we could go surprise mummy at work, because a little birdy told me that it was rather quiet in the office today." "Yaaaaay! Can we play a game on the way?" "Which game would you like to play?" "Ah... I must say, that is a personal favourite of mine." He swung her up in his arms, tossing her into the air a few times with a grin on his face. "So... y'know, I never saw it coming... how long have you been a baddie?" "I'm not the baddy silly." "You're not! But that means..." He starts pointing at himself, with a fake look of shock on his face. "That means..." He slowly puts her back down, and moment her little feet touch the ground, he dashes off down the corridor. "You'll never catch me Fuzz!" "OH NO!" She screams, pew-pewing at Soule as her legs move a thousand miles an hour in chase, resulting in a waddling trot. "I'LL SAVE YOU MOMMY!" Shaking himself out of his daydream, he opened his eyes, and gazed back at Izzy. Words failing him, he kissed her tenderly on the lips and swayed with her for a moment, hoping he conveyed his answer without the need for words. "I'll.. um.. I'll take that as a yes.." She whispered, and went in for another, more lingering kiss, all of her nerves fading away. "I love you, Imzadi." She looked up at him, her eyes shining. "I love you too." The smile on his face threatening to etch itself permanently on his features, he'd never had an horizon like that to look forward to before. And despite all the plans, upon backups, upon contingencies that he made, none of them felt so important as this one. He pulled back to the now, and looked back to the open hatch. "Now..." He paused to sweep his fingers through her hair, still smiling at her. "I think we were on a quest, to find the lost flowers..."
"Then we must find them." She grinned. "Lead on.."
He grinned back. "Yes, ma'am."